Goodreads Summary: For sixteen years, Alyssa Gardner has lived with the stigma of being descended from Alice Liddell -- the real life inspiration for Lewis Carroll's famed novel, Alice’s Adventures in Wonderland. But cruel jokes about dormice and tea parties can’t compare to the fact that Alyssa hears the whispers of bugs and flowers ... the same quirk which sent her mother to a mental institution years before. 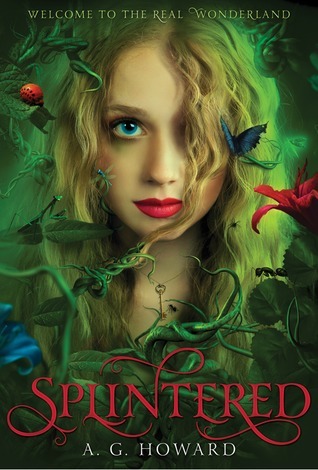 Why am I waiting on Splintered? The cover is so gorgeously creepy and perfect for a story involving Alice in Wonderland! The summary sounds awesome and fantastical. I can’t wait to read this! What books are you waiting on? Visit me at A Midsummer Night's Read! Thank you for highlighting my book, NC! I'm working on the galleys right now and I can tell you they took as much care w/the inside as they did w/the cover. The designers at Amulet are wonderful! Nice to meet you! Cool-I haven't heard of this before but it seems to be part of a larger trend incorporating classic authors and works into YA literature. I have fond memories of Alice in Wonderland so this looks really interesting! I've seen this one on a few lists, and it's so going on my TBR list RIGHT NOW! Great pick! I saw this one today for the first time somewehre else and I really need to get my hands on it! Whoa! Cool book! Haven't heard of this one yet! Definitely adding it to my TBR list! ...not a huge fan of the cover, though. This is my first time hearing of this book but it sounds very interesting! It will definitely be going on my to read list! Darn you! I come here & already in the first 2 posts I have an even LONGER TBR list! :D I hadn't heard of this one but I really want to read it. I love those stories with quests & family heirlooms & madness. Oohh fun. Thanks! Oo, ooo! How was this not on my radar? So creepy and cool! Love that cover and I love the premise, too. Thanks for the heads up!